This energetic trip explores one of Tuscany's hidden gems, the stunning Garfagnana Valley. Combine kayaking, via ferrata, mountain biking and walking the Cinque Terre coastal path. At the end of each day we return to our homely farmhouse and enjoy home-cooked Tuscan cuisine. Active adventures - Kayaking, trekking, cycling, high ropes adventure park, canyoning and zip wires as well as the opportunity to visit Lucca and Pisa. Characterful accommodation - relax by the pool with views of the charming Garfagnana Valley. Cinque Terre - Walk the UNESCO World Heritage landscapes of the Tuscan Riviera. Arriving in Pisa today, we transfer to our farm stay accommodation in northern Tuscany's Garfagnana region. We will be based in the lovely setting of a family run farm, situated in the beautiful and lush Serchio River Valley. Retaining all the character of its Tuscan heritage, the farm is surrounded by the magnificent scenery of the Apennines and the Alpi Apuane. On arrival we will enjoy a traditional dinner and sample for ourselves some of the food and wine for which this region is justifiably famous. Indeed during the coming days ahead we can expect to sample a delicious array of local produce including freshly made breads and home-made jams, delicious honey and excellent wine. If your flight is earlier than the picking up time at Pisa airport, there is the opportunity to travel into Pisa by bus at a cost of around 2 Euro and bags can be stored at the airport. This morning we head by bus to San Romano and Buffardello Park where we spend our first morning climbing trees. Set amongst two and a half hectares of forest in the heart of the Garfagnana, this unique adventure park affords children and adults alike the opportunity to enjoy this woodland setting from the air, with a range of activities suitable for all ages, including swinging beams, suspension bridges, nets, ropes and obstacles. On arrival, you will be kitted out with all the necessary safety equipment with trained instructors on hand to supervise your enjoyment. Please note there are 10 courses in total, to climb the full course there is a minimum height requirement of 140cm. There are three courses suitable for children over 100cm; children under 100cm will not be able to take part in this activity. The park also has a number of walks and activities within the forest that do not require leaving the ground, so don't worry if you would prefer to keep on terra firma. This afternoon we take a short bus ride to the beautiful Lake Gramolazzo where we take to the water in double seated kayaks and stand up paddle boards to explore this lovely setting. There is ample time to paddle, kayak, swim or relax on the grassy banks of the water's edge. The lake is home to an abundance of blue herons and other birdlife and our kayaking adventure affords us an ideal opportunity to take in this serene setting from the unique perspective of its tranquil waters. Our day over, we return back to the villa to enjoy some relaxing time around the pool. Please note that the order of the activities may change due to weather conditions or other operational considerations, any changes will be advised on the trip by our Explore leader. We leave the Garfagnana and after a short transfer to the local station, join the train to the stunning coastline of the Cinque Terre region where tiny villages nestle amongst sheer cliffs to create one of the Riviera's most scenic delights. The area is a World Heritage Site and its five villages present the perfect picturesque setting for our day. We have time to explore the back streets of the old part of Monterosso, which is the largest of the five villages, before we walk along the famed coastal trail. Passing through olive groves and vineyards and with spectacular views all around, we arrive at Vernazza where we have time for a swim in the lovely waters as well as have lunch which could include some of the local seafood. From Vernazza, we then have the choice from to travel by boat (optional extra, and sea conditions permitting), catch a train to Rio Maggiore or walk another section of the trail to Corniglia. For those that wish to, it is also possible to sea kayak between Vernazza and Rio Maggiore, please refer to the optional excursion section for more details. The 20 minute boat trip to Rio Maggiore is normally the best option as it allows more time for kids to swim and enjoy lunch in Vernazza plus gives the opportunity to view the other villages including Corniglia and Manarola. Arriving in Rio Maggiore, there will be time to explore the town with another swim or ice cream here before we then meet up for our train back to the Garfagnana. We depart the villa after breakfast to explore some of the breathtaking views in the Apennine mountain range. We drive by bus up into Orecchiella National Park, an area characterised by beech woods, grasslands and sheer rock faces hanging over narrow gorges, all of which are a natural habitat for birds of prey, wild boar, deer and many other animals. We begin our walk from the visitors centre up to refuge Isera (1200 m) with great views of the Pania del Corfino mountain along the way. We then ascend from Isera following the footpath to the Col of Campaiana at 1500m for around an hour which affords great views of the Appenines before a final short walk up to the peak and summit of the Pania del Corfino at 1600m. With probably one of the best views of the Garfagnana Valley where one is nearly able to see all of our locations that we will travel to during our stay this week, we have our lunch and then relax before descending back down using the same routing to the visitors centre which is close to a brown bear enclosure. And then it's time for an ice cream before we head back down to the farm where we can relax and enjoy the pool for the rest of the afternoon. Today is free to spend as you wish. You may decide to explore something of the area's cultural highlights, with a trip to the cities of Lucca and Pisa. Travelling by bus or train you can head to the old Roman colony of Lucca which is set on the Lucchese Plain with a fascinating mixture of terracotta roofs, Romanesque churches, ancient Roman ruins and Renaissance architecture. Enclosed within its city walls is a delightful mix of narrow lanes and easy charm with the opportunity to hire bikes and explore it's captivating environs on two wheels. Alternatively, you may just wish to wander its streets and explore the local market and take to the city walls and relish something of the delightful ambience of this beautiful city. Alternatively, Pisa is close by - a city that is so much more than just its famous Leaning Tower. The Campo dei Miracoli (Field of Dreams), of which the Tower is but one part, also contains the Baptistery, Duomo and Camposanta, which between them make up a stunning collection of architectural delights. These, along with the churches and palazzi that make up the historic centre, all belong to a period from the 11th to 13th centuries when the city was one of the Mediterranean's major maritime powers. This morning we jump in a bus and head south to the Turrite valley where we will try our hands at the exciting activity of canyoning. Arriving in the pretty village of Fornolovasco, we get into our wet suites and helmets for an easy section of canyoning down the Rio Pinguino in the parco Battifero which allows us to try some small water jumps. Ending back at Fornolovasco we have lunch beside the river with time to relax here before the afternoon in Parco Battiferro. We walk up initially to the dry canyon above the village where we change into our harnesses and helmets and take on some Via Ferrata. Clipping ourselves on and off the wire, we descend down the canyon with time to look at the amazing rock features and some small caves here. Arriving at the bottom, we end our time here on a zip wire and suspension bridge. We have time to relax at the bar at fornolovasco with an ice cream before we all group up and return to the farm by bus. Our final day sees us heading by bus up to San Pelllegrino where we stop to see the mummified bodies of two saints before driving further up to Alpe de San Pellegrino (1600 m) with great views over the Garfagnana valley and across the whole chain of mountains. After getting our bikes, we get on our bikes and undertake a thrilling and beautiful descent back into the Garfagnana valley. Along the way we stop for photos and breaks via the Pass of Radici, in the heart of the Apennines. Returning to the villa by bike, the rest of the afternoon is free for you to enjoy at your leisure. The entire route today is on tarmac roads and involves about 25km of descent followed by 15km undulating roads along the valley. Only 10% of the ride is uphill. You may wish to stay by the pool before a final farewell dinner. Today we transfer to Pisa airport where the tour ends at 1100. For those of you that have an afternoon or evening flight, there is the opportunity to travel into Pisa before returning to the airport for your flight. The airport has luggage storage facilities and regular, inexpensive shuttle buses into town. This is at your own expense and unaccompanied but the leader will be able to assist with information and what better way to finish a trip to Tuscany than visiting Pisa! Day 5: Full day Trip to Lucca and/or Pisa - Train €13 per person (return ticket), Leaning tower of Pisa €18 per person, no child discount. Pisa cathedral €3.50 per person, bike hire in Lucca €2.50 per hour. Day 5: Day trip to Florence - €8 each way on train, 2.5hrs each way. July and August are the hottest months, but early and late in the season go prepared with clothing to suit drops in temperature and the showers. You'll need your swimming gear, light rainwear may be needed at any time of year, and a warm fleece/jacket is recommended for cooler evenings and nights. Comfortable walking boots, trainers and sandals. One main piece and a daysac. A water bottle, sunhat and high factor sunscreen are all essential. You may also wish to bring cycle helmets with you for the mountain biking. A torch is useful in case of powercuts/ emergencies. This trip stays at an agriturismo (accommodation located on a working farm) with departures either staying at Le Casine or La Costa. Both provide a charming family atmosphere for your holiday with a swimming pool that has views of the Tuscan landscapes with comfortable, rustically furnished en-suite rooms and home-cooked traditional Italian meals, often using produce from the farm. Wi-Fi is also available. The accommodation in Le Casine is either in a small comfortable lodge within the grounds of the estate or in the main lodge adjacent to our communal dining area. This lovingly converted 18th century barn and outbuildings provides a charming traditional family atmosphere for your holiday. Furthermore, the location allows for a perfect setting for your adventure amidst the superb Tuscan countryside with magnificent views of the surrounding oak and chestnut woods and across to the mountains of the Alpi Apuane and is surrounded by lovely gardens with plenty of quiet areas to sit and read. The outdoor swimming pool overlooks the village and surrounding countryside. In the main building, there's a communal area with a lounge to relax in as well as the main dining area where Wi-Fi can be accessed. Guests are accommodated in both the main farm building (a former barn) and independent chalets which have been converted from the farm outhouse buildings. The chalets accommodate guests in independent apartments, each for two people. Some have private bathrooms whilst others share a bathroom between two apartments. No more than three people will share one bathroom. The two double rooms in the main villa have en suite bathrooms and are next to the communal lounge and dining room. The alternative accommodation is La Costa which is located in the centre of the small medieval village of La Villa. The property dates back to medieval times and is said to have origins back to the 12th century as an Ospedale or rest stop on one of the area's trade route. The main house later became a convent. This property enjoys magnificent views of the surrounding oak and chestnut woods and across to the mountains of the Alpi Apuane and is surrounded by lovely gardens with plenty of quiet areas to sit and read. The outdoor swimming pool overlooks the village and surrounding countryside. In the main building, there's a communal area with a lounge to relax in as well as the main dining area where Wi-Fi can be accessed. The 11 rooms at La Costa are all different and have been simply furnished in the traditional Tuscan style with antique furniture and tastefully decorated in pastel tones. Rooms are set up in the style of an apartment, with each accommodating two people in a double/twin bedroom with TV, en suite bathroom and private kitchen. Whilst we can cater for both gluten free and lactose free diets; almost all food is sourced locally. Given the rural location, choice is limited. If there are particular snacks or products you need we advise that the best option is to bring these with you. Local living: Our Active Tuscan Active Adventure was one of the original Family Adventures launched by Explore over 15 years ago and has proved a firm favourite ever since. Join Rupert and his family at their family farm in the beautiful Garfagnana Valley. Rupert, originally from Kent in the UK, moved over to Italy nearly 19 years ago. 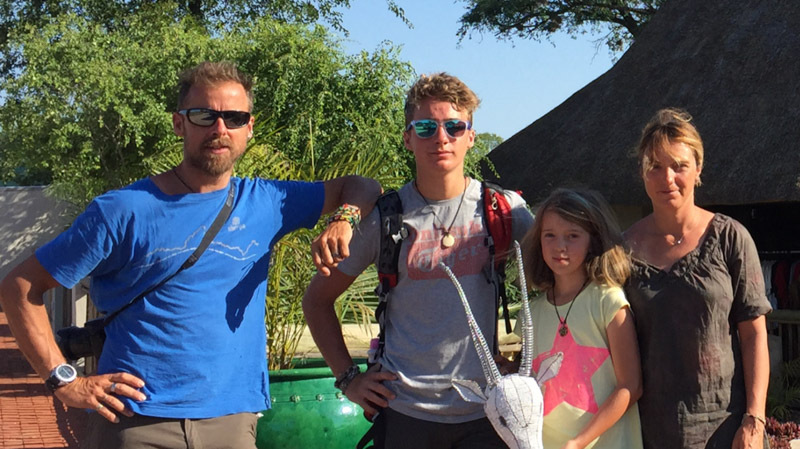 His love for travelling started when he was 18 years old travelling for over a year in Africa. This love for travelling brought Rupert into tour guiding, which after many seasons of work around the world he found himself sent to work as a guide in Northern Tuscany in the mountains of the Alpi Apuane and the Apennines. One of the highlights of the trip is the Tuscan villa we stay in. This beautifully resorted collection of cottages is the perfect setting to kick back and relax with a glass of wine in hand after a busy day of activities. Enjoy a dip in the pool followed by a freshly prepared home cooked meals under the pagoda, the perfect blend of adventure and relaxation in an idyllic setting, where one is made to feel really at home. Triple rooms: This trip allows the option for a triple room to be included within the booking, suitable for a family of 5. If you would like this option please ask our Sales team for further information. 7+ departures: Three additional departure dates are offered over the summer holidays for children aged 7 and above, in 2019 these depart on 10th, 17th and 25th August. Please refer to the downloadable trip notes for further details. This holiday is perfect for active families who enjoy the outdoors all set against the stunning backdrop of Tuscany. Our Tuscan farm accommodation has been specifically chosen as a base to offer a range of activities with a swimming pool and great views to lure you back after the day's adventures. We also get the opportunity to explore the historic cities of Pisa and Lucca which offers a good balance to kayaking, coastal walks, mountain biking and canyoning. Furthermore, with a number of included meals and activities, this adventure offers great value for money.